Offering free fitness facilities, free refreshments 24 hours a day and free WiFi, this hotel is located in Berlin’s popular Hackescher Markt area. Alexanderplatz is just a 10-minute walk away. The designer rooms at Casa Camper Berlin include air conditioning, a TV, a spacious seating area and a bathroom with natural daylight. Natural soaps, toiletries and slippers are provided. The Tentempié Lounge on the top floor offers a panoramic city view and serves free drinks, yoghurts, fruit, snacks and fresh salads 24 hours a day. Guests can also enjoy free use of the Finnish sauna and gym at any time. 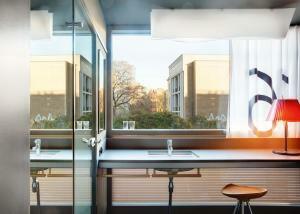 Casa Camper is a 10-minute walk from UNESCO Museum Island and the historic Unter den Linden boulevard. There are many bars, restaurants and art galleries nearby. Hackescher Markt Train Station is a 5-minute walk from Casa Camper Berlin Mitte. This offers a direct connection to Schönefeld Airport. The nearby M1 metro line offers convenient tram connections between the central Berlin attractions and the popular Prenzlauer Berg going-out area.. 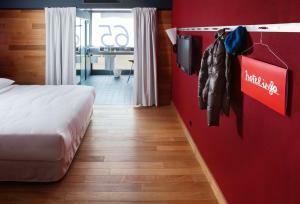 Designer room with air conditioning, free WiFi and 24-hour access to the top-floor lounge with free refreshments. Only 1 extra bed is allowed in this room category.